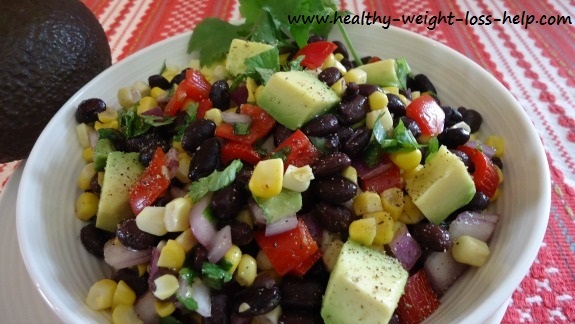 This black bean salad recipe is low in calories, yet it's packed with protein and fiber, which makes it filling, healthy and perfect for weight loss. Black beans offer lots of fiber, which aids in digestive issues, such as constipation. Studies have shown this soluble fiber is also helpful in lowering cholesterol levels, lowering the risk of heart disease and helps prevent the rapid rise of blood sugar levels making it an excellent choice for people suffering with diabetes or hypoglycemia. They also provide much needed carbohydrates, calcium, iron, magnesium, phosphorus, potassium and more. 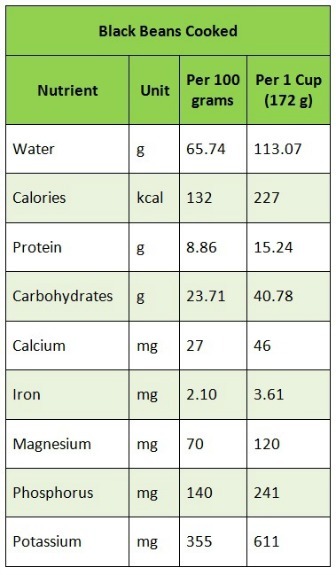 According to the USDA National Nutrient Database for Standard Reference here is the nutrients for cooked black beans. Place oil, lime juice, cumin, garlic, salt and pepper in a mixing bowl and whisk these ingredients until well blended. Now add all other ingredients and toss well. Calories per serving is 154 (if you omit the olive oil) otherwise it's 174. Some folks prefer canned beans while others prefer to buy the dried ones in the package and cook them up themselves. Whatever your preference, these legumes are incredibly healthy to eat. If you have purchased canned beans, please rinse and drain them well. If you prefer using dried beans instead of canned then you must prepare the beans first. Soak one cup of dried black beans overnight, then rinse and drain. In a pot, place the beans in plenty of water and bring to a boil, then reduce heat and simmer for 45 minutes to 1 hour, or until cooked. Then drain and let cool. Whenever cooking beans it is important to check the package for cooking times as some beans may vary. Once cooked, drained and cooled, they are ready to use just like the canned variety. Fill your belly up with this low calorie healthy salad that is rich with fiber, protein and nutrients. It’s so diet friendly and at the same time tasty and filling.